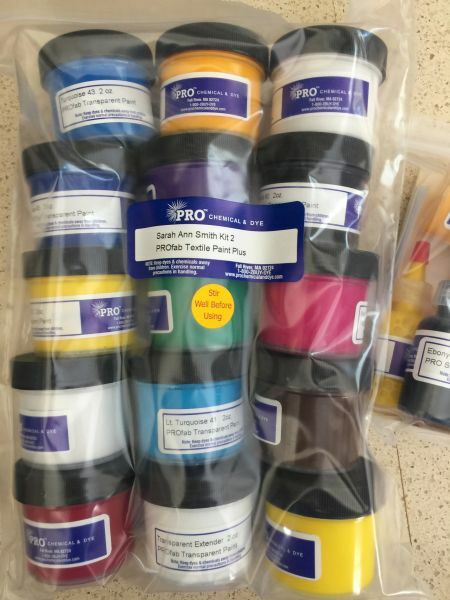 Sarah's custom TRANSPARENT PLUS kit includes both ProChemical and Dye PROfab transparent, opaque and pearlescent paints plus extender. This combination allows you to paint directly with the PROfab Transparent, but also darken and *lighten* cloth to customize fabric you already have. SHIPPING NOTE: both kits fit into one box--save on shipping and order Sarah's DUO Kit instead of one each of the kits. Cost is $34 for the kit plus shipping--US shipping only (sorry to those outside the US). Current USPS flat rate medium box is $14.35. I will explore if I can ship for less (probably) using regional rate or regular shipping prices. BOTH Paint kits can fit in a medium box, please see "Two Kits" item which saves on shipping cost! Available April 20th! $48.35 I will turn on the Add to Cart button about April 6th so you can pre-order. Please note that I will be travel teaching and cannot fill orders until on or after April 20. Thanks for understanding.